Navajo saddle blankets come in a variety of sizes, colors, and thickness. The earliest saddle blankets were created in the 1870s. During the 1890s Navajo Saddle blankets made from Germantown wool became fashionable, and are some of the most intricate eyedazzler's ever executed. They were tightly woven and done in numerous bright colors. Often woven on store bought cotton twine, these did not hold up to the heavy use on a horse and saddle. These are highly collectable especially when in good condition. 1900 to 1930 was the golden era of Navajo Saddle blankets. Many of the most uniquely Navajo pieces were executed during this time. These simple yet elegant navajo rugs are very collectable today especially some of the more simplistic designs. Single Saddle Blankets were roughly 30 inches square, and Double Saddle Blankets were of similar width, but about twice and long and were doubled over when in use to provide extra padding. Early saddle blankets often were woven in simple striped patterns, and double saddle blankets now are sometimes difficult to distinguish from small wearing blankets of the Transitional Period. By the end of the period, saddle blankets frequently had patterns only at the corners or edges since only those parts of the blanket were visible when in use. Double saddle blankets sometimes had a different pattern on each half. Fancy Saddle Blankets, often featuring bright colors, elaborate patterns and fringes, were probably more for show than function. 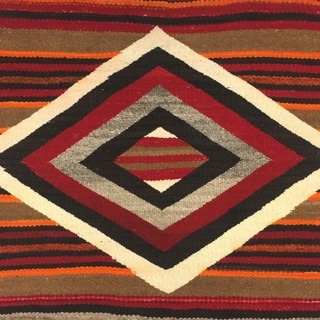 The Navajo typically made twill saddle blankets with two contrasting colors to create a vibrant optical effect. Navajo Banded Design Double Saddle Blanket, circa 1920, 60" x 27"
Navajo Double Saddle Blanket "Ethel Brown"
Navajo Double Saddle Blanket "Marion" c. 1900-10, 49.5" x 34.5"
Navajo Double Saddle Blanket c. 1900-20s, 53.5" x 33"
Navajo Double Saddle Blanket with the Initials AMc, Ex Anita Da Collection, c. 1950, 53.75" x 31"
Navajo Double Saddle Blanket with Valero Stars and Tassels, c. 1940, 59" x 33.5"
Navajo Double Saddle Blanket with Valero Stars in Each Corner, c. 1950 52.5" x 37"
Navajo Double Saddle Blanket, c. 1890, 49" x 32"
Navajo Double Saddle Blanket, c. 1900, 50" x 34.5"
Navajo Double Saddle Blanket, c. 1900, 53" x 33.5"
Navajo Double Saddle Blanket, c. 1900, 54" x 33.5"
Navajo Double Saddle Blanket, c. 1900, 54" x 35"
Navajo Double Saddle Blanket, c. 1900, 57" x 40.5"
Navajo Double Saddle Blanket, c. 1900-10, 58" x 26"
Navajo Double Saddle Blanket, c. 1910, 54" x 31"
Navajo Double Saddle Blanket, c. 1910s, 55" x 34.5"
Navajo Double Saddle Blanket, c. 1920, 53.5" x 34.5"
Navajo Double Saddle Blanket, circa 1900, 56" x 33.5"
Navajo Double Saddle Blanket, circa 1920, 53" x 31"
Navajo Double Saddle Blanket, circa 1991, 62" x 32"
Navajo Double Sided Double Saddle Blanket c. 1900, 60.5" x 29"
Navajo Double Weave Double Saddle Blanket c. 1960s, 53.75" x 35.5"
Navajo Eyedazzler Single Sunday Saddle Blanket with Central Square Design, c. 1930, 28" x 35"
Navajo Pony Saddle Blanket, c. 1900, 18.75" x 22.5." Navajo Single Saddle Blanket c. 1920, 30.5" x 31"
Navajo Single Saddle Blanket c. 1930, 28" x 32"
Navajo Single Saddle Blanket with Central Diamond Design, c. 1930, 30.25" x 28.25"
Navajo Single Saddle Blanket with Interlinking Border Design, circa 1920, 24.25" x 32.25"
Navajo Single Saddle Blanket, c. 1890, 31" x 30"
Navajo Single Saddle Blanket, c. 1890, 32" x 32.5"
Navajo Single Saddle Blanket, c. 1900, 24" x 32"
Navajo Single Saddle Blanket, c. 1910, 26.5" x 31"
Navajo Single Saddle Blanket, c. 1920, 25" x 28"
Navajo Single Saddle Blanket, c. 1920s, 28" x 35"
Navajo Single Saddle Blanket, c. 1930, 29.5" x 33.25"